I took my first ever class with my machine this past week. 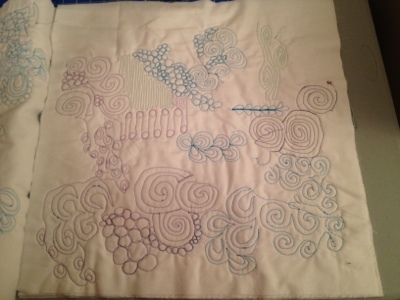 I've only taken one class ever, and that was a hand applique class. 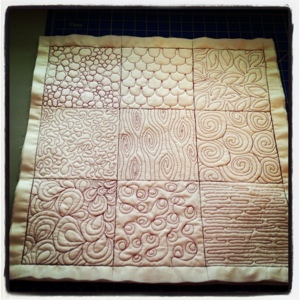 This was a free motion quilting class, since I've definitely caught that bug! I've been doing a lot of research and blog reading and youtube watching, and needed a little bit of direction in person to get started. 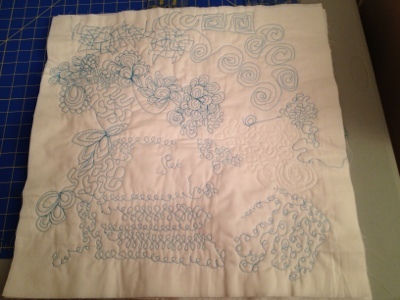 A couple of weeks ago, I did my first little bit of free motion, just tracing the design on a large-scale print, which I did while I was making the cover for Marsha Sue. This class was a really good experience, though a little intimidating! I learned that I've been winding my bobbin wrong for yeeeaaaars! It was funny coming in and seeing all these other women with their crisp white fancy machines, and then mine with it's nice "vintage" patina. Hahaha. So Marsha does NOT like FMQ. I feel like most of the class time I spent dealing with broken threads and mangled bobbin thread. I also learned that the tension on my machine is seriously jacked up. I just never knew it because that's all I've ever known! We made it happen eventually though. Anyway, here is the fruit of my labor. Not impressive, to say the least! The day after the class, I gridded off one of the sandwiches I had made and gave it another good ol' college try. Much better this time, but still a long way to go!